JAKARTA—Daniel Caluag isn’t retired and not even overweight. Those he proved after bagging a bronze medal in cycling’s men’s BMX at the Jakarta International BMX track on a hot and humid Saturday morning in the 18th Asian Games. “I didn’t get the result I aimed for but I am happy to contribute a medal for the Philippines,” said Caluag, now 31, told BusinessMirror. As predicted by BusinessMirror, Japan’s Yoshitako Nagasako, a former Asian champion, clinched gold in 33.699 seconds with Indonesia’s Gusti Bagus Saputra claiming silver in 34.314. Caluag was an unrelenting third in 35.842 in the event raced over a UCI-regulation track which the Filipino-American who works as a Nurse in the US, described as “excellent” both for training and competition. PhilCycling President Abraham “Bambol” Tolentino hailed Caluag’s accomplishment despite falling short of the gold he won in Incheon 2014. The bronze, Tolentino said, is good enough for Caluag and Philippine cycling. “Not bad after four years. When it comes to BMX, the Philippines is still the team to beat,” he added. Caluag won the only gold the country won in Incheon four years ago. In these Games, the Philippines has only one gold so far courtesy of Hidilyn Diaz in weightlifting. Caluag’s younger brother, Christopher John, meanwhile, failed to make the finals after bombing out of the three motos (heats). Sienna Elaine Fines, on the other hand, made the finals but finished fifth in the women’s final topped by China’s Zhang Yaru, Thailand’s Chutikan Kitwanitsathian and Indonesia’s Wiji Lestar. “So close—only two tads short,” Fines, one of the most popular Filipinas in the Asian Games because of her good and innocent looks, told BusinessMirror. But the Asian Games, she said, gave her the motivation to work harder. “This has been a great experience. 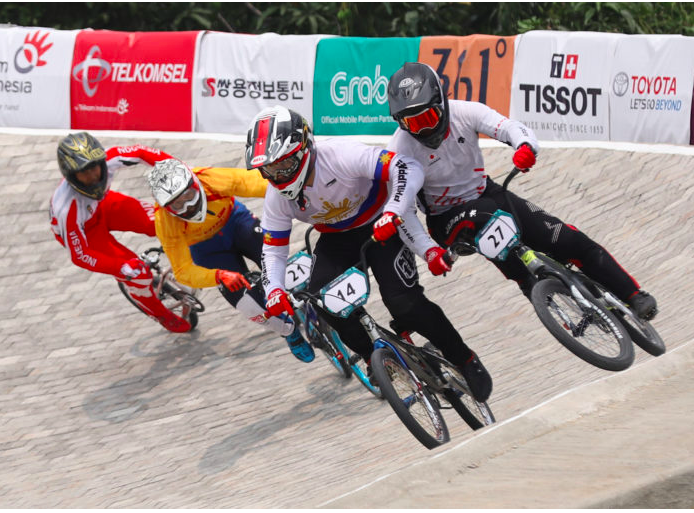 This is the Asian Games and it’s like the Olympics already,” said the 19-year-old who skipped school for the last three years to focus on BMX racing. Zhang clocked 39.643 to win gold in the cycling discipline that drew a big crowd. Kitwanitsathian finished .736 of a second behind, with Lestar coming in 1.145 seconds later. Thai Chamavee Kerdmanee finished ahead of Fines. With Caluag’s bronze, the Philippines improved to a 1-0-7 gold-silver-bronze haul to remain in 22nd place in the tally board.